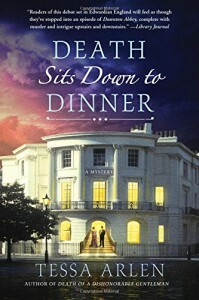 Death Sits Down to Dinner is the second book about amateur sleuths Lady Clementine Montfort and her housekeeper, Mrs.Jackson, the first book is Death of a Dishonorable Gentleman. At a birthday party for Winston Churchill, hosted by Hermione Kingsley who is a patroness of a large charity. A death occurs at this party, a man, Sir Reginald Cholmondeley is the deceased stabbed in the chest. Clementine is the person who is first on the scene of the murder. Hermione has insisted that no one talk about the murder that happened at her dinner party, this includes all of her staff. Everyone who attended the party is questioned by Detective Inspector Hillary and as time progresses, Clementine is not too happy as to how the investigation is progressing. Hermione is to host a huge event to support England's largest charity but with the illness of her companion Adelaide, Clementine offers the services of her housekeeper, Mrs. Jackson. Kill two birds with one stone if your will, Mrs. Jackson can assist with coordinating the event and snoop around to find out exactly what the staff knows. The two women are insistent on finding out who killed Sir Reginald and why. This story takes place in 1912, a tenuous time in England with the unrest that is happening not only in England but in the rest of the world. England is preparing for such an event with the development of airplanes. Winston Churchill is sure that there will be a war with Germany, as First Lord of the Admiralty he founded the Royal Navy Air Service to prepare for this event. This is an Edwardian mystery that reminded me of the show Upstairs, Downstairs, filled with real and imagined characters, upstairs and downstairs at two households. The glitter of high society in England makes this novel a treat to read. I learned one interesting fact, the women who worked in these households were called Mrs. no matter the age or whether they were married or not. The men were called John or William, as these names were easy to remember and acceptable names. I had not read the first book, Death of an Honorable Gentleman but that in no way confused me as the author made reference on a few occasions of the murder mystery that involved Lady Montfort and Mrs.Jackson. A fast paced story that was very enjoyable to me.